Oh my gosh! I LOVE it! Such a beautiful barn....even the setting it perfect. Thanks for taking a picture of it for me. You're so awesome! It will look so pretty in my scrapbook room. Glad you all have fun in Maine. That really is a lovely picture! 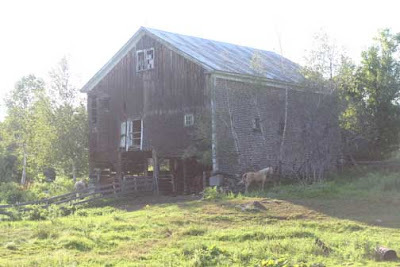 I too like barns and all things farm related. Looks like I'd love hanging out there! What does that mean you had a few issues with sunblock and showers??? I take it they didn't get showers and they were burnt??? Kristi, no showers, and my ds told my MIL he didn't need sunblock in 90 degree weather in the sun on the water and that was ok with her! But shame on her, I would not be happy!!! You know how white Cole and I are, we always put the sunblock on him (not always me!). He has been a little pink once!!! What a gorgeous photo Pam!! Hope you had a good time.